Cortactin is a class II nucleation promoting factor (NPF) that binds to actin filaments and influences their stability. Cortactin specifically stabilizes Arp2/3-mediated branch points along actin filaments through its repetitive actin binding sites  (reviewed in ). Although cortactin is a weak activator of the Arp2/3 complex when compared to class I NPFs (e.g. WASP, SCAR/WAVE), cortactin also binds to other NPFs (e.g. 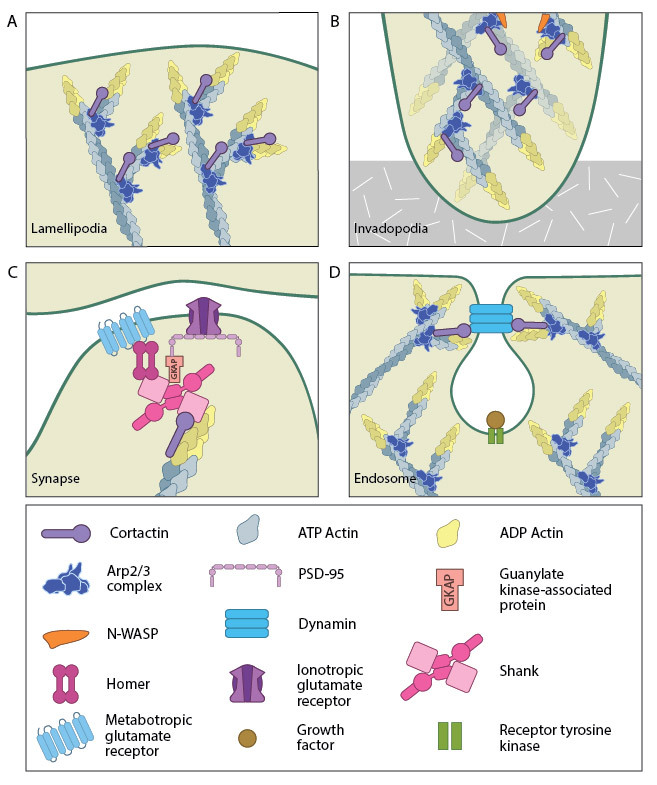 N-WASP) and their interacting proteins (e.g. WIP). This association may help to both recruit and activate Arp2/3 complex-mediated nucleation of actin filaments . This schematic diagram illustrates the molecular organization of cortactin (reviewed in ) and provides examples for how cortactin is represented in figures throughout this resource. Relevant domains believed to be important for cortactin activity are highlighted. Cortactin comprises five major domains . The N-terminal acidic domain weakly binds and activates Arp2/3, via a DDW motif. The actin binding domain contains four to six actin binding repeats , with repeat four coordinating F-actin binding . Each repeat is made up of a stretch of 37 amino acids. 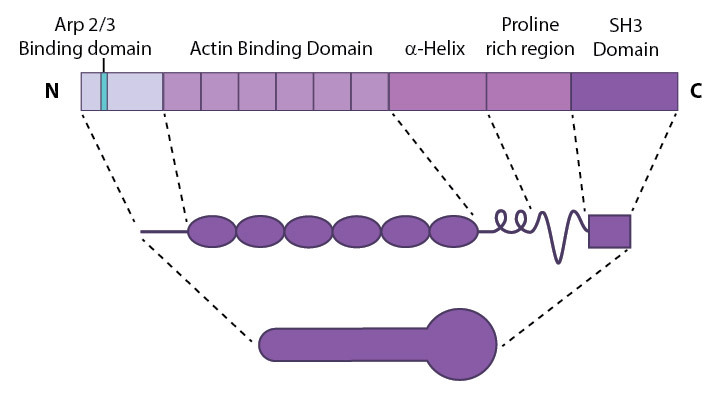 An SH3 domain (Src homology domain 3) facilitates binding of proteins containing a conserved proline-rich motif, such as Shank , dynamin-2  and N-WASP . Where else is cortactin found? Functionally, cortactin is involved in a wide range of cellular processes pertaining to a variety of structures. The protein is highly enriched in mature neurons and is necessary for the formation and stability of dendritic spines . It also associates with post synaptic densities (PSDs) of neurons expressing the ionotropic glutamate receptor, NMDA (N-methyl-D-aspartate). This association is via a weak interaction with the PSD protein Shank . The function of cortactin at PSDs is not yet clear but it is speculated to facilitate changes in the actin cytoskeleton in response to synaptic activity. This is supported by the translocation of cortactin to synapses in response to stimulation by glutamate . A. Cortactin stabilizes Arp2/3-mediated actin nucleation. B. Cortactin forms part of the actin-rich core of both podosomes and invadopodia. C. Cortactin is enriched in post-synaptic densities involved in glutametergic signalling. D. Cortactin binds to dynamic during endocytosis. Cortactin also forms part of the actin-rich core of both podosomes and invadopodia . Actin polymerization within invadopodia is essential to the function of this structure and the migratory behavior of cancerous cells . Cortactin also promotes cell motility in normal cells and as such localizes to lamellipodia . It enhances lamellipodial persistence i.e. increases the time spent protruding, through its interactions with both Arp2/3 and F-actin. Cortactin demonstrates a notable preference for newly polymerized actin filaments i.e. those containing a greater amount of ATP-actin over ADP-Pi-actin . However cortactin itself is not thought to nucleate actin within the lamellipodium , but rather serves to stabilize newly polymerized actin filaments in order to promote lamellipodial persistence . Cortactin is also involved in non-migratory cellular processes, such as the formation of cell-cell contacts. Cortactin localizes to sites of N-cadherin mediated cell-cell adhesions, where it forms a complex with N-cadherin and serves to strengthen the intercellular contacts . 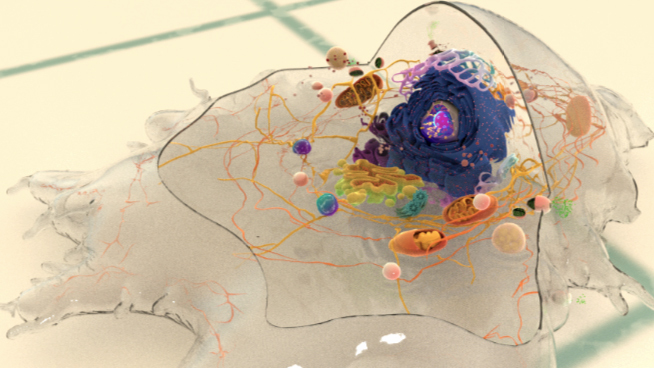 It also localizes to endosomal compartments , specifically clathrin-coated pits , where it is involved in receptor-mediated endocytosis. It is suggested to link the actin cytoskeleton and the endocytosing vesicle through its known interactions with F-actin, dynamin-2 and Arp2/3 . These interactions are speculated to not only support a role for cortactin as a scaffold, but also to contribute to the dynamic action of endocytosis through the actin nucleating activity of cortactin .